My daughter was born in 2000. My children are growing up in a new millennium. I hear people all the time lamenting what kids have today that "I didn't have when I was a kid!". I've decided that this way of thinking is silly. Each generation is different than the one before. Each age brings new technologies, new ways of thinking, new norms. Do we really need to begrudge the fact that our kids will never know life without the Internet? 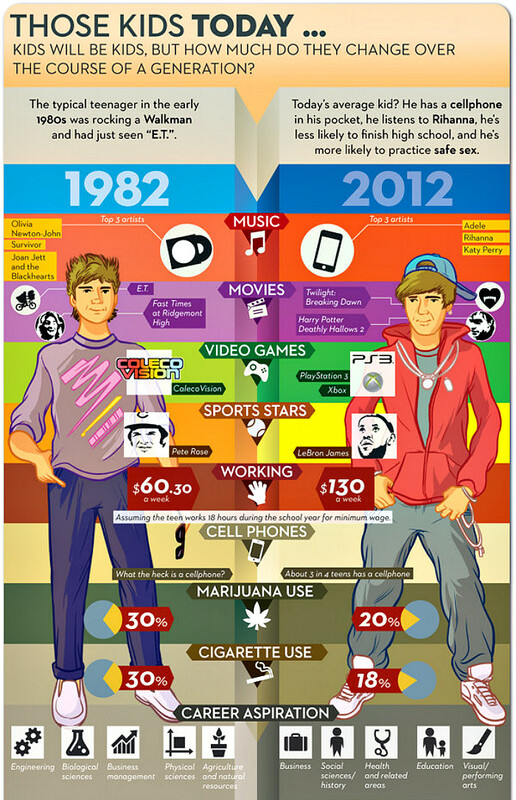 The above infographic is perfect because I grew up in the '80s (turned 8 in 1982). Life is much different in 2012, even if the fashions have come back around! 2. Cell phones - we got our daughter one in 6th grade. Don't think I had my first one til I was at least 22. Camryn will probably have one for the rest of her life. 3. Video game consoles - sure, a handful of my friends had the very first Nintendo, but now pretty much EVERY kid has a game console, or two. 4. YouTube - I used to watch music videos on MTV. My kids can pull them up whenever they feel like on YouTube. 5. No screen hours - hubs and I had to institute a rule of "no screen time" hours each day. Neither of us needed this rule. 6. Cursive - I spent a great deal of my 3rd grade year learning to write in cursive. My daughter, on the other hand, had a measly "unit" on writing in cursive. Probably only so she can sign her name. 7. Recycling - I don't think we recycled at all when I was kid. Now, our recycling bin is bigger than our trash bin. This is a good thing! 8. When you know better, you do better - I remember my mother being very impressed with how much I knew about Camryn's development from the moment she was conceived, and how best to take care of myself during pregnancy to give her the best start I could. 9. My children are gorgeous! And so are most of the kids I know. I'm pretty sure people are evolving to be better and better looking with each generation. 10. Dishwashers - yes, yes, dishwashers have been around for a long time. But I NEVER had one growing up. At least not a working one. It was my job to wash, dry and put away each and every dirty dish. As soon as I left home, my mom and step-dad bought a dishwasher. But I'm not bitter. Maybe. It is my hope that we will one day live in a Star Trek world. I wish it was now, but maybe for my grandchildren or great-grandchildren? By the way, it is my firm belief that if you wore a style the first time it was popular (such as leggings), you are not supposed to wear it when it comes back around. Just sayin'. 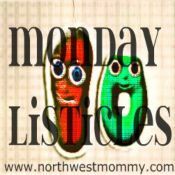 Come back on Friday for my monthly TGIF linky, to look back on the HAPPY of August! You had me at 'Infographic'. I love you. Loved the graphic! I want to live in the Star Trek world too ;) Just beam me there, please! GREAT image... happy that cigarette use has gone down. I love that infographic!!! Really shows the difference. My oldest just asked my what a dictionary is. I explained and he said "don't we just google that?" that graphic is so awesome! I don't begrudge my kids all the fun technology they have these days. But I still totally am teaching them how to muck out a stall. it's good to be well-rounded. I'm with everyone else on the graphic...awesome!!! My older son (now 19) printed all through school. When he actually has to cursive write, it looks like someone who's just learning. Oi-vay. Very nice post and interesting to read .... I love visiting this blog.